Alexander Low was a prominent Dundee flax and linen manufacturer and senior partner in Messrs Alexander Low and Son, Hillbank Linen Works. He was an active councillor and bailie in his younger years, later devoting his time to charitable works. 22-04-1878 In his will of 01-071878 he left a personal estate of £61,930 and total amount of £84.352. United Presbyterian later Congregationalist - Treasurer and Deacon of Ward Chapel, Constitution Road: Alexander Low took a great interest in missionary and other religious societies. Liberal - a strong supporter of the Anti-Corn Law movement. Member of Provincial Grand Lodge of Forfarshire. An active Voluntary throughout his life. Subscriber 89 – Messrs Gourlay Brothers – William Gourlay became Alexander Low’s son-in-law, having married his daughter, Davina Russell Low in 1865. 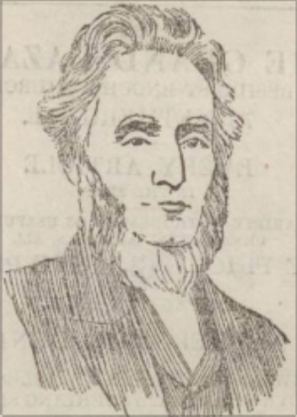 Subscriber 154 – Robert McGavin – Alexander Low’s brother-in-law, Alexander Greig (married to his sister, Helen Low), was a brother of Robert McGavin’s bother-in-law. It was reported in his obituary that Alexander Low served his apprenticeship in Dundee, after which he left the town for London where he spent a year or two. There was no listing for Alexander Low in his own right in the local directory between the years 1824 (by which time he had reached his age of majority) and 1829. On returning to Dundee, he joined his father, Andrew Low, a manufacturer, who operated a small spinning mill on the Dighty Water. On expiry of the lease of his father's premises, the Lows built their first mill (Low's Mill) on what was then called the 'Upper Dens.' This would become known as the Hillbank Linen Works. The exact date of the construction of this mill is unclear, although it seems that it was in operation by 1833. By 1834, Andrew achieved a listing under 'Andrew Low & Son,' mill spinners and manufacturers. At that point, Alexander Low would have been 31 years of age. It would appear that Alexander and his father continued in business together during the 1830s and 40s. His father, Andrew Low, died in 1848, being described as a 'manufacturer in Hillton of Dundee.' 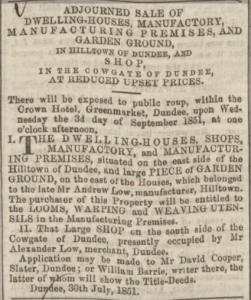 By 1851, his father's premises in Hilltown and office in the Cowgate were advertised for sale. Alexander Low continued in business under the same title, being joined by his son, Andrew Beharie Low. Alexander Low was born to Andrew Low, a manufacturer in ‘Hillton of Dundee’and Catherine Whitton, in 1803. The Lows would appear to have belonged to the earlier pioneers working with jute. Although Thomas Neish had introduced the fibre in Dundee about the year 1822, early attempts at spinning this new tough fibre saw little success using existing machinery. In 1832, Mr Neish persuaded James Watt Jnr. to ‘make trial of ten bales.‘ Through Watt’s inventiveness, foresight and perseverance, he was able to present the town’s spinners with a fibre which had been torn down and teased or formed into tow, which proved to have better results in the spinning. 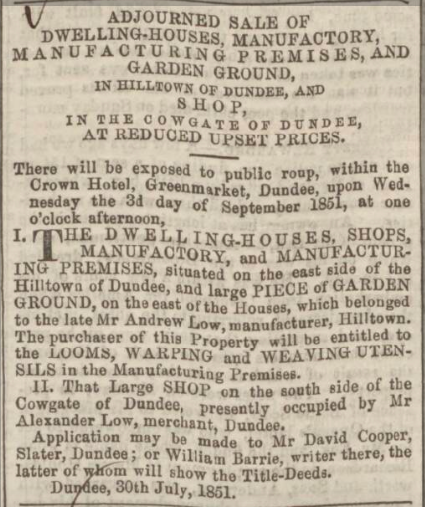 A year later, on 31st August 1833, Messrs Andrew Low & Son, bought 140 bales at £16 10s a ton, of a consignment brought to Dundee by Mr Watt (as did a small number of other firms). It was to prove quite some time before jute finally found recognition with the spinners and manufacturers of the town. Accidents within and around mills and factories were not uncommon occurrences. However, Hillbank Linen Works became the location for a rather grisly case of suspected infanticide. An overseer discovered a black object floating on top of one of the ponds. On being retrieved, the bundle was found to contain the body of a child. It was surmised that clearly, this had been no accidental death, as a stone or somesuch had been attached to the child’s neck in order to keep it under the water. In 1866, Alexander Low, in his early 60s, was described as having been ‘diligent and successful in business,’ found himself to be in a position to purchase the handsome estate of Butterstone in Perthshire. It was there that he spent the summer and autumn months, enjoying his 700-800 acres near Dunkeld. Having been active in business and public life in Dundee until the 1860s, Alexander Low devoted his later years to the management of charitable organisations and spent more of his time at his estate of Butterstone. His son and business partner, Andrew Beharie Low, succeeded to the Butterstone estate. In 1894, Alexander Low’s daughter in law presented the Directors of Dundee Lunatic Asylum (one of his favoured institutions) with a photograph of her father in law, to be hung in the boardroom of the institution. Old Parish Registers. Dundee. Births. (1803). 282/ 90 460. Scotlandspeople website. Old Parish Registers. Dundee. Marriages. (1832). 282/220 98. Scotlandspeople website. Census Records. Dundee. (1841). 282/ 109 11. Scotlandspeople website. Census Records. Dundee. (1851). 282/ 54 40. Scotlandspeople website. Census Records. Dundee. (1861). 282/ 2 27/ 29. Scotlandspeople website. Dundee Postal Directory, 1861-62. p166. Dundee Central Library, Local Studies. Dundee Courier. 21 September 1866. p.2. Findmypast website. Statutory Registers. Dundee. Deaths. (1878). 282/1 189. Scotlandspeople website. Legal Records. Wills and Testaments. Dundee Sheriff Court. (1878). SC45/31/28. Scotlandspeople website. Obituaries. Lamb Collection 118. Dundee Central Library, Local Studies. Northern Warder. 3 April 1845. p.5. Findmypast website. Dundee Evening Telegraph. 23 April 1878. p.2. Findmypast website. Dundee Postal Directory, 1861-62. p.37. Dundee Central Library, Local Studies. Dundee Postal Directory, 1864-65. pp.32-34. Dundee Central Library, Local Studies. Northern Warder. 13 April 1869. Findmypast website. Statutory Registers. Dundee. Marriages. (1865). 282/2 425. Scotlandspeople website. Dundee Courier. 23 April 1878. p.2. Findmypast website. Dundee Postal Directory, 1824-25. p.127. Dundee Central Library, Local Studies. Dundee Postal Directory, 1829-30. p.34. Dundee Central Library, Local Studies. Watson, Mark. Jute and Flax Mills in Dundee. (1990). Tayport. Hutton Press. p.210. Dundee Postal Directory, 1834. p.28. Dundee Central Library, Local Studies. Legal Records. Wills and Testaments. Dundee Sheriff Court (1848). SC45/ 31/ 8. Scotlandspeople website. Dundee, Perth & Cupar Advertiser. 29 August 1851. p.1. Findmypast website. Ordnance Survey Name Books. Forfarshire (Angus). (1857-61). ScotlandsPlaces website. Warden, Alexander J. The Linen Trade Ancient and Modern. (1864). London. Longman. pp.68-72. Southern Reporter. 9 September 1869. p.4. Findmypast website. Dundee Evening Telegraph. 26 January 1894. p.2. Findmypast website. The information above about Alexander Low has been collated from a range of digital and hard copy sources. To the best of our knowledge it is correct but if you are relying on any information from our website for the purpose of your own research we would advise you to follow up the sources to your own satisfaction. If you are aware of an inaccuracy in our text please do not hesitate to notify us through our Contact page.